Home > 50% OFF/BOGO DEALS! 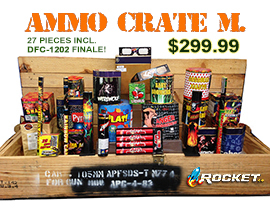 > Enter to Win a FREE Ammo Crate! Enter to Win 1 of 2 FREE Fireworks Packages in our twice-yearly draw! The winning names will be announced just before Canada Day and New Year's Eve. Contest open to Canadian Residents over the age of 18 only. Freight charges may apply to Beyond Point or Ferry Destinations. To enter, you must fill in all fields below.